The comprehensive individual language technology solution for the company owned intranet. For translations and more. Lingenio Translation Server (LTS) offers text translation with integrated dictionary look-up, as well as website translation on the fly for your own company intranet just like the package of translate intranet. However, it is adjustable according to the number of licenses and integrated services. Using the glossary maker you can have the vocabulary, contained in a text, automatically arranged and, using the DictionaryBuilder, create new dictionaries from translations. In addition, LTS has a lot of solutions for text work like summary, standardization, simplification or evaluation of texts. Make your own choice as a customer, which features of the server you will need and create together with us your customized version of the Lingenio Translation Server. Using the translation service, just like Lingenio’s online translator wwwtranslate, texts can be translated from German to English or French, English to Chinese and vice versa. (other languages such as Spanish, Italian, Portuguese or Dutch if required). LTS requires only installation on a server and its functionality, using a JSON interface, can be easily integrated into any web page. Every user with access to your intranet can immediately use the translation service. With the LTS you will receive a company license so that the service can be provided to everyone in the enterprise without temporal and spatial reservation. Translating web pages and texts, the comprehensive system dictionaries and the Lingenio subject vocabularies will be included (among others for the subjects IT, economy, law). User dictionaries (with e.g. company terminologies) and translation archives (translation memories) can be connected, in order to receive translations that are as suitable and as consistent for your company as possible. User dictionaries and sentence archives can be prepared and edited with the software translate 12.1 pro netzwerk, contained in the package of delivery. 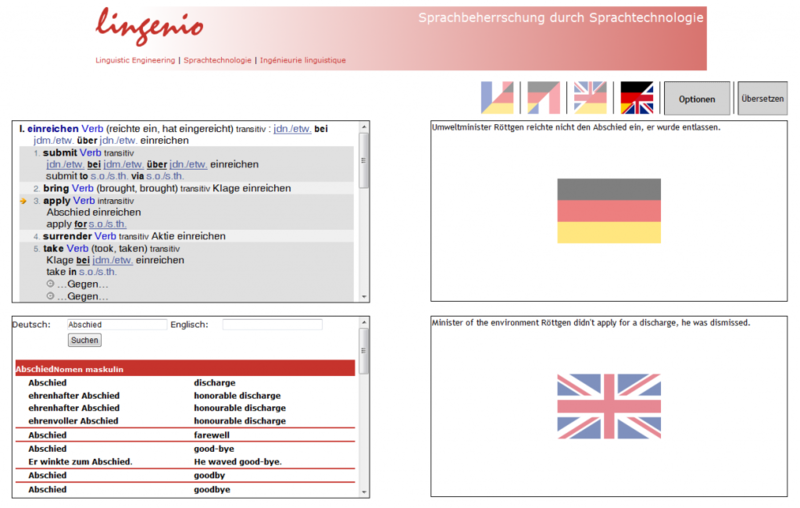 Webpages of all kinds can be localized and translated with Lingenio Translation Server. Company glossaries and terminology can easily be integrated into the dictionary and made queryable for everyone. This way the uniform use of expert terms as well as the foreign language competence of the employees will be promoted. The integration of terminology is made by us without additional costs. The inventory brought in by customers will only be prepared for you and not made accessible to a third party. The dictionary, which can be searched arbitrarily, contains vocabulary of more than 500,000 words with translations, idioms and examples for use. The vocabulary will be permanently updated and the updates are made available to the customers without delay. This is why the program is considerably different from conventional dictionaries. If desired, enquiries are taken down and evaluated with regard to missing words. Dictionary and translation service can thereby “learn”, what is important for you as a user.